Kaleem Sheikh is a London based singer/musician, musicologist, and indian film and poetry expert. He was trained in Indian Classical music by Ustad Sultan Khan , to whom Kaleem was introduced by Jay Visvadeva of Sama Arts Network and Sachal Music, and has performed at the personal requests of the Late Ismail Merchant ( Merchant Ivory Films ) and Shahjarian ( The foremost singer in Iran ). Kaleem has performed for audiences in the Indian film industry comprising of musicians such as Shambu Sen, Samir Sen, and Raj Kumar Rizvi. Kaleem has also worked for BBC Radio as a broadcast Music Journalist where he presented the A – Z of Indian Film and Classical music, whose work has been endorsed and acknowledged by members of The House of Lords in Britain. He has also worked as an advisor to Asian Arts Access and numerous other arts and theatrical organisations in Britain, and has contributed work to CNN/IBN live and was the specialist music advisor to the BBC Television documentary “London Calling”. Kaleem holds a Bsc ( Honours ) in Research Methods and Statistics and an MA in Sociology. He also holds the Duke of Edinburgh Award. A former London Policeman, Kaleem has also worked in Community Development and Cohesion for London Borough Of Ealing where he was the foremost Officer in reaching out to new communities and working with the Metropolitan Police on safer neighbourhood projects, and empowering community groups to become active stake holders and forming panels to meet Officers from the Audit Commission. Kaleem has given evidence to the Public Accounts Committee ,and has received acknowldegement for this. He has also featured in a Home Office documentary on neighbourhood safety. Kaleem has successfully represented applications of asylum seekers to secure refugee status in Britain and also secured spouse visas for refugees in Britain. Kaleem has also lawyered at the Royal Courts of Justice, County Courts, and Immigration and employment tribunals. In November 2009, Kaleem presented a feature on the influence of poetry in Indian cinema at Kings Place ( the home of The Guardian ) Ibn live, the premier news channel in India , have utilised the information on this website to feature in a programme on music and shared the platform with John Mole and other noted celebrities in British Cinema. 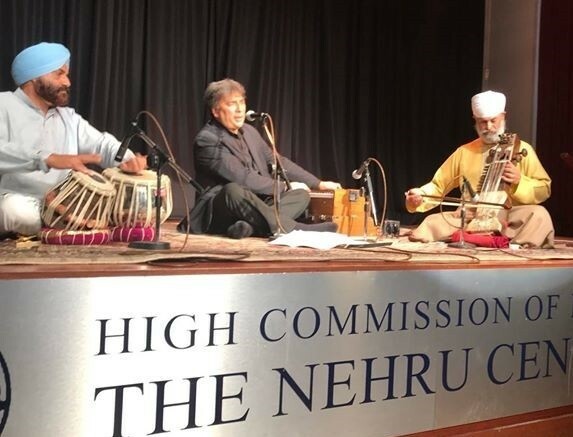 In 2016 , Kaleem sang to a full house at the Nehru Centre, Indian High Commission. in memory of Ustad Sultan Khansahib. The concert was produced by Sama Arts and has received outstanding reviews which are available on this site.